Depending on the kind of work you do, that may actually be true. If you’re running relatively simple jobs that are light on complexity or color content, a RIP upgrade may not pass the price/performance ratio test. But, if you handle a lot of jobs submitted from outside sources, you never really know what you’re going to get and that could spell trouble with a large dollar sign. I recently heard from a user whose RIP software was several years old. His dealer had tried to convince him that he was overdue for an upgrade but he resisted spending the money to bring it current. Shortly thereafter he found himself eating a $6,000 print job because elements were missing and nobody noticed until the job was delivered. The PDF submitted for printing contained multiple transparency layers and his old RIP was not able to interpret it properly. In this particular example you could fault the shop’s quality control as much as the RIP. After all, there are many prepress tools to help operators catch mistakes before its too late, not the least of which is good proofing method. But the fact remains, if your RIP is current, you eliminate the lion’s share of issues caused by inaccurate interpretation. This entry was posted in Tips & Advice, Vendor News and tagged Prepress RIP, Prepress Workflow, Upgrade RIP, Workflow, Xitron on September 10, 2018 by Billi Jean Johnstone. Perrin is an employee-owned screen printer, located in Comstock, Michigan, with over 200 employees. Perrin’s customers include theme parks, museums, airports, sports teams and resorts worldwide. To meet the demand, twenty M&R screen printing presses are fed by three M&R i-Image ST computer-to-screen imaging units that produce up to 900 screens a day. Prior to the Xitron system being installed, color transitions (gradients) were a problem, according to Kern. “It wasn’t smooth transitioning between, for example, 10% and 40%.” The need for improved quality sent Perrin looking for solutions that would complement the built-in software on their CTS systems. Industry consultant Lon Winters of Print This, Inc, recommended the Navigator workflow. After a six-month evaluation and study, Perrin determined the Navigator workflow greatly exceeded expectations. Xitron’s Navigator Harlequin RIP is a best-in-class implementation of Global Graphic’s Harlequin RIP technology. Providing prepress environments with fast, predictable, and reliable interpretation of PostScript, PDF, and EPS format files, Navigator is the most trusted name in RIP architecture with over 35,000 installations worldwide. This entry was posted in Testimonials, Vendor News and tagged Collegiate Apparel, Customer Snapshot, Harlequin RIP, navigator, Perrin Resort, Workflow, Xitron on September 5, 2018 by Billi Jean Johnstone. The perfect CTP for small format printers – at an unbeatable price! 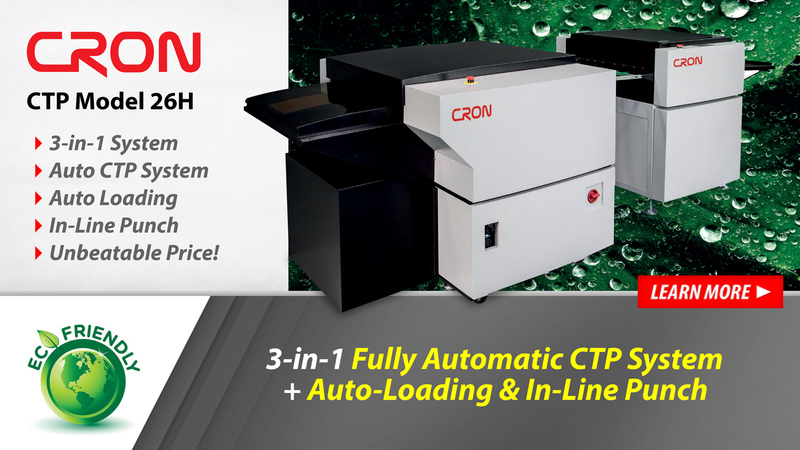 This complete Eco-friendly package includes the perfect 2-page CTP solution: the CRON CTP Model 26H, the compact all-in-one CTP, auto feeder, imager, punch and conveyor. Featuring comprehensive automation options, this system offers fast, highly cost-efficient UV plate production and the most convenient footprint for small format printers available today. The CTP Model 26H (26”/670mm format) is the first in a line of automatic 3-in-1 integrated imaging systems designed by CRON. The H-series system combines fully automated plate loading with precision imaging, punching and transport, providing a low cost, easy-to-use and compact unit which is easy to maintain. With a total footprint just 60% the size of comparable units, this system offers high performance alongside improved convenience and cost efficiency. The exposing engine, based on CRON’s market-leading magnetic linear drive platform, provides fault-free imaging across a wide choice of resolutions with registration accuracy up to 0.01mm and a tonal range 1-99%, in either conventional or stochastic screening. Consistent drum pressure control, and integrated online punching for up to 3 punching heads, enables precise registration for a wide range of formats. This entry was posted in Prepress and tagged 26h, Computer-to-Plate, cron, ctp, eco friendly ctp, fully automated ctp, uv plate production on May 3, 2018 by Billi Jean Johnstone. Graphic Whizard demos at your door! Graphic Whizard will be heading our way on June 11th and June 12th, 2018. 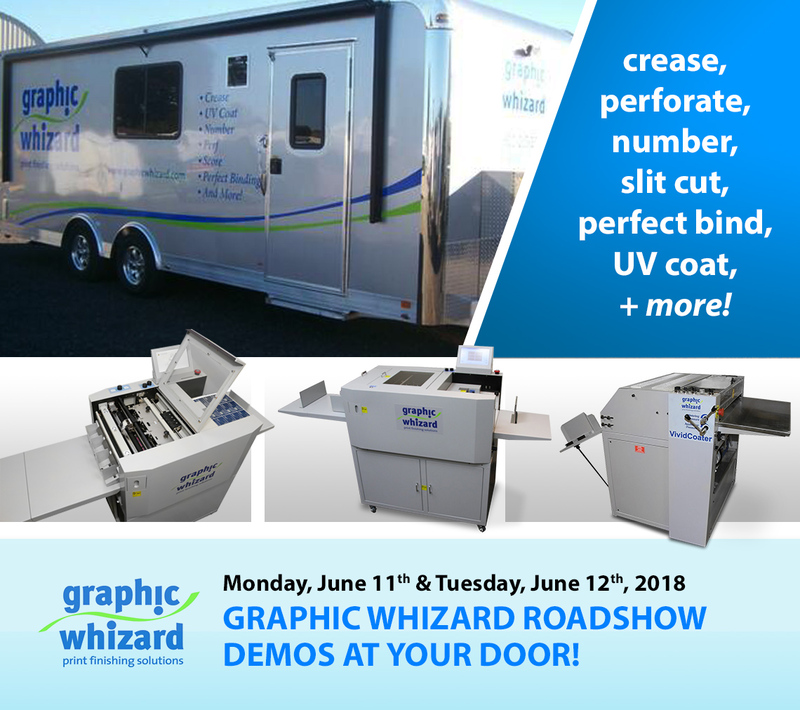 Graphic Whizard will be coming our way with their mobile demo unit on Monday, June 11th – Tuesday, June 12th, 2018. They will be ready to demo a slit-cut-crease machine, a UV coater, a perfect binder, a creaser knife folder, a numbering machine and much more! This is a great opportunity to bring some sample work to put through the machines they have on hand. If you would like to reserve a time for your onsite demonstration or would like to stop by, click here to register. This entry was posted in News & Updates, Special Events, Vendor News and tagged Creaser, Demos, finishing equipment, Graphic Whizard, Numbering, Perf, Roadshow, VividCoater on April 24, 2018 by Billi Jean Johnstone. The Challenge brand is well known for excellence in innovation, reliability and durability. The EH-3 model of paper drills have been the industry-standard for over 50 years, with over 50,000 units sold worldwide. The rugged steel and cast iron design of the EH-3 provides accurate drilling for years to come. Powerful hydraulic operation minimizes operator fatigue and results in consistent, clean holes. The taper-fit shank design ensures that our drill bits will seat centrally and securely into the spindle. The EH-3 can drill 25% more stock on every stroke with its standard 2-1/2” drill bits. The EH-3 utilizes an automatic-return of the drilling heads as standard equipment, minimizing the contact between the drill bits and the drilling block. This allows for longer intervals between sharpening and longer bit life. The Challenge EH-3 proudly displays the UL label, providing added assurance of our quality and safety. Proudly manufactured in the US, the EH-3 continues our legacy of providing assurance you made the right decision. Click here for your instant brochure download or watch the video below! This entry was posted in Paper Drilling, Vendor News and tagged Challenge Machinery, EH-3, Paper Drills, Print Finishing on January 23, 2018 by Billi Jean Johnstone. The Horizon CRF-362 Creaser/Folder gives Printmates an advantage on short-run digital work. Click here to read the full article or watch a product video below! This entry was posted in Uncategorized and tagged Creaser, CRF-362, Digital Finishing Equipment, Folder, Horizon, Printmates, Standard on January 15, 2018 by Billi Jean Johnstone. 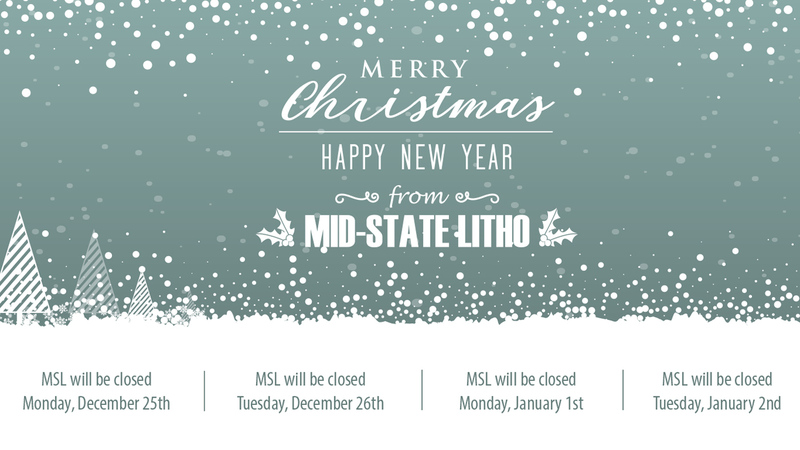 In observance of the Holidays, MSL will closed for the Monday, December 25th – Tuesday, December 26th and Monday, January 1st – Tuesday, January 2nd. We wish you all a safe and happy holiday season! This entry was posted in News & Updates, Special Events and tagged Holiday Hours, Mid-State Litho, MSL on December 18, 2017 by Billi Jean Johnstone. PUR…What is it and why should I care? Polyurethane Reactive, commonly referred to as PUR, is a polyurethane-based adhesive that is attracting popular attention due to superior binding strength, flexibility and eco-friendly nature. There is a growing demand for digital color book binding, with much of the imaging being done on high gloss paper stock. Conventional EVA hot-melt glue has difficulty creating a strong bind on coated stocks and generaly has poor lay-flat qualities. However, PUR hot-melt glue can provide superior bind strength and lay-flat of offset and digitally-imaged sheets printed on a wide range of coated stocks. PUR bound books also outperform their EVA counterparts in their ability to maintain integrity of the bind under extreme temperatures, from – 4° to 248° F for PUR versus 32° to 140° F for EVA. What does all this mean? For example, an EVA-bound snowmobile user manual might become brittle in winter, while pages might fall out of a car manual that’s been baking in a glovebox during the heat of summer. PUR also provides superior binding strength versus EVA adhesives, and has page-pull and page flex ratings that can be 40 to 60% higher. Uncured PUR is thermoplastic in nature; it reacts with the moisture in the air and within the paper stock to create a strong cross-linking bind that is resistive to re-melting. PUR is applied in a much thinner layer, so usage per book is less than EVA. The thin application and flexible nature of cured PUR enables books to open more easily to the gutter and lay flatter, preventing the book or pages from turning or closing prematurely. PUR is less affected by the wide variety of inks, varnishes, oils and solvents that can migrate into the glue line and cause EVA adhesives to fail. 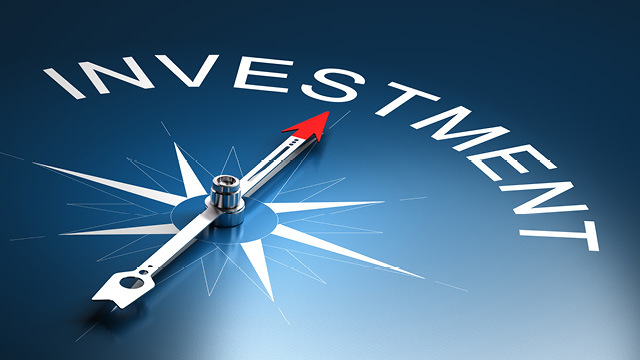 Additionally, PUR will create a superior bind on certain substrates such as coated stocks, photographic papers, recycled stocks, crossgrained stocks, acetates, and digitally imaged stocks. Although most PUR adhesives are very versatile, it is always best to discuss your applications and binding system with your adhesive supplier to insure that you are using the right adhesive for the best results. PUR scores points in terms of environmental friendliness too. PUR-bound books are fully recyclable, whereas EVA glue must be separated from the paper. Energy conservation is another plus, since PUR is applied at 248° F whereas many EVA hot-melts are applied at higher temperatures. If there is a drawback to PUR versus EVA, it is that the books generally require a longer cure time prior to three-knife trimming or\handling of the books for operations such as casing-in and packaging. EVA sets-up very quickly, so books can be trimmed and shipped almost immediately after binding. 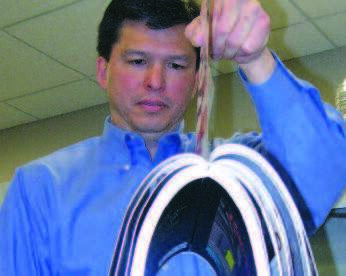 Many of today’s PUR products will set sufficiently for trimming in a matter of minutes, but full cure time will vary widely depending upon a number of factors such as: binding substrates, book thickness, available moisture in the air and paper stock, as well as the specific adhesive being used. However if you are looking for a stronger, more flexible bind on a wide range of substrates, PUR just might be the answer. Article provided by Standard Horizon. Click here to download original article. This entry was posted in News & Updates, Shared Articles and tagged Book Binding, Horizon, pur, pur glue, Standard on October 23, 2017 by Billi Jean Johnstone.